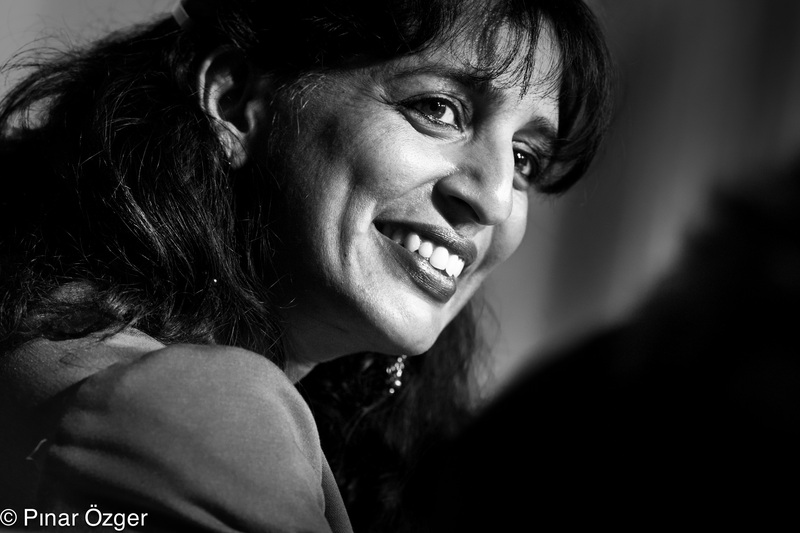 The networking world is in a frenzy ahead of Cisco’s Insieme launch on Wednesday. Insieme represents the networking giant’s response to the threat of commodity white-box hardware and software-defined networking that has been the talk of the industry for the last three years. The news in the last week is partially the industry’s players making their positions clear ahead of the launch Wednesday of Cisco’s Insieme platform. You can view this news like the bustle of a regional office ahead of a major visit by the CEO. Such visits make waves in the status quo, and for all intents and purposes, Cisco is the CEO of the networking world — with a huge install base, thousands of engineers and its own software-defined networking standards group. On Monday, Arista Networks announced a series of products that are more about the company’s software than its networking gear. Meanwhile, last week as the Open Networking User Group conference, Cumulus, the hottest networking startup since Nicira launched version two of its Linux-based operating system for commodity switches. Cisco’s launch on Wednesday will not only validate the software-defined networking hype, but it will also underline some big shifts in networking. The same changes that server virtualization wrought on the hardware world years ago are happening in networking. In servers, the launch of VMware’s hypervisor led to enterprise server consolidation as customers searched for a use case (much like companies are searching for SDN user cases today) and then enabled business model disruptions such as Amazon Web Services and the rise of white-box servers and the Open Compute Project. Cisco saw all of that play out and doesn’t want to find itself in Dell’s or HP’s shoes. So it is focusing on becoming a control point in the emerging virtualized stack and putting greater emphasis on software. As the IT world moves steadily toward virtualization and the agility it can provide, the networking world hasn’t kept up. So there are physical and technical demands placed on networking that are relatively new to the current scaled out and virtualized IT environment. But given the importance that computing has to a wide variety of business (for companies like Google and Facebook, computing is the cost of goods sold) the lack of agility that the current networking infrastructure results in, as well as the high cost of the proprietary systems that are used, are causing business constraints. Networking cables along the ceiling at Facebook HQ. So in 2011 and 2012, protocols like OpenFlow and debate over SDN became the new hotness with everyone from Google and Comcast to large investment banks trying to figure out how to make their networking more agile and cheaper. It looked bad for Cisco, Arista and Juniper as the idea of bare metal switching and white boxes for webscale data centers could cut into its hardware margins. It also looked bad for them, as their products didn’t seem agile enough to really offer a “true” software-defined network. It also looked like an opportunity for startups ranging from BigSwitch to Embrane and Plexxi, all of which are developing software to help manage sprawling networking rollouts virtually. And for Pica8 and Cumulus, which were trying to build out white-box networking infrastructure to lower costs. 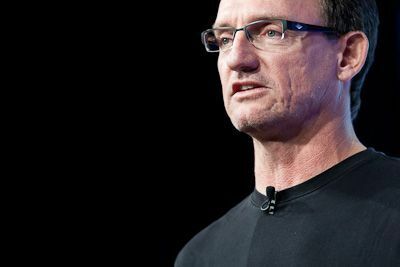 Once VMware bought Nicira for $1 billion and change in 2012, it looked like a battle royale was shaping up between VMware and Cisco for the heart and soul of networking in the enterprise. And that’s where we are today on the SDN front. For the technical and architectural issues that networking is facing, Cisco is going to advocate what it calls an application-centric infrastructure, which in normal-people speak means that Cisco’s vision of networking cares about what the application wants first. For those in the IT world this is as obvious as telling someone that you’re against killing infants, but when you break it down it’s a big mental shift (for Cisco, others in the startup world are advocating this too). The networking world of old said it cared what the application wanted, but the application had to speak network’s language. So the application had to figure out if it needed more bandwidth or was experiencing latency issues or whatnot. But when the application comes first, this means you offer the application (and developers) a way to see how the network affects your application. So if something breaks, the developer doesn’t have to go looking for the networking code book to describe the problem because the networking infrastructure and software does the work. 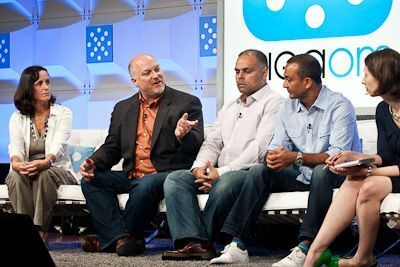 (L to R): Pascale Vicat-Blanc – Founder and CEO, Lyatiss; Dave Husak – Founder and CEO, Plexxi; Vijay Gill – GM, Microsoft; Najam Ahmad – Director, Technical Operations, Infrastructure, Facebook; Stacey Higginbotham, GigaOM Structure 2013 discussing the application-aware network. Now the details of how Cisco will implement this shift are what we’re looking for on Wednesday when it launches Insieme, but in the meantime it’s worth pointing out a few distinct effects Cisco’s rhetoric has had so far. For example, Big Switch, a startup that had been portraying itself as the anti-Cisco for much of its history, has flipped its focus from building out overlays for software-defined networking to subscribing to more of Cisco’s vision, which involves a virtual network that is closely aligned with the physical network. The battle in this fight will be Cisco and VMware trying to offer customers a control point between the application and the network. It’s like the iOS versus Android battle playing out in the enterprise networking space. Both Cisco and VMware are wooing big networking software and appliance providers to create an ecosystem, while others wonder where Microsoft or EMC is as this plays out. I wonder that too. That’s just the SDN piece, which is all about making networks more agile. And honestly, this is what the enterprise customers probably care most about. But there’s also that idea of bare-metal switching which is the concept that instead of spending a lot on a proprietary Cisco box, you’re going to buy a commodity box that uses merchant silicon and some kind of open source OS to control it. This is where Cumulus, NEC, Broadcom and Pica8 and even Big Switch are trying to offer products. While it’s easy to say commodity boxes will win, based on the cost, that may not be how all this plays out. For example, Arista, which made its name recognizing the shifts in data center networking needs years ago, today did something pretty interesting. It launched a suite of hardware for middle-of-row and end-of-row gear with a heavy emphasis on two things: the software and the openness of the software. At a macro level, this announcement addresses the threat that white-box companies and OS vendors like Cumulus present to Arista’s business, but it might also present a way forward for Cisco and Juniper as they are threatened by this same threat of commodity switching or so-called bare-metal switching. They need to shift the conversation from buying high-margin hardware (that happens to have a lot of proprietary software smarts) to one that emphasizes the software, how well it works with other applications and why the box isn’t the product. Will that be enough to mitigate the white box threat? Given that it’s still really unclear how big the white box threat will actually be, my hunch is Cisco has time. Time it can use to continue defusing the threat that SDN represented to its closed and proprietary ethos. Like China’s Communist leadership, Cisco is trying to walk the line between its older economic models and newer ones that acknowledge the reality of today. All without sending the whole entity into a spiral. Jesus, so much junk. Guess what? You do not need to reconfigure VLANs if you design things *properly* and if you do not design things properly no amount of SDN is going to help you because using SDN is akin to using bubblegum to rather than cement and welding to build a skyscraper. I see it as a battle of the better solution for the datacenter. As in cost + software ease of use + stability + performance + ease of troubleshooting. I agree it’s looking like Cisco vs. VMware. Cisco has a lot of application smarts (e.g. WAAS, MediaNet / AVC), can they bring that to bear on the problem? The key will be how well a solution works end to end: for instance, if I scale that VM, will the network reconfigure itself on the fly? The emphasize is here on end-to-end complete product. If a solution only works in parts, it might not provide much of a benefit over the status quo of standard change control processes. It will be seen whether those SDN software will be just hooks into API of standard enterprise networking, mainly involving Vlan reconfiguration, or the next level provider grade networking riding on MPLS, or whether an entire new breed of products based on OpenFlow. I think the answer to that does not really matter that much immediately as long as the product is complete and as such can displace opex and is able to mold the way change controls are managed today, including the often hostile relationships between server, networking, and security groups.